You'll be £35.00 closer to your next £10.00 credit when you purchase The Crimean War. What's this? Following repeated visits to the Crimea over a number of years, Dr David Jones, with the help of local guides, was able to identify and photograph every important location related to one of the nineteenth century’s most deadliest conflicts. These have been set besides original paintings and photographs to produce a collection of the most fascinating images ever seen of the Crimean War. The locations of the great battles of the Alma, Balaklava, Inkerman and the Allied batteries and encampments of the siege lines in front of Sevastopol are all presented in glorious full colour. With detailed explanations of the significance of each set of images, placed within the context of the war, The Crimean War Then and Now provides the reader with an unprecedented visual record. Dr Jones’ major work is certain to be regarded as the definitive pictorial study of the war in the Crimea. Each of the well-constructed chapters is lavishly illustrated with contemporary paintings, maps, aerial imagery and recent photographs. It is an almost faultless production. David Jones is to be congratulated for achieving masterly photographic comparisons between the photographers and artists who worked in the Crimea and the scenes today taken from the exact spots. Divided in to sixteen chapters and covering every conceivable perspective, the work is a fascinating compilation and the result of painstaking research combined with local knowledge. This book is an essential addition to any Crimean War library and is highly recommended. A veritable feast for the eyes and an unusual, original approach to the subject that will be most appreciated bu those planning a visit to the Crimea, who will find it a most helpful guide to Balaklava and the battlefields. It all adds up to a splendid publication, with excellent production standards, and a great pictorial guide to the Crimean War. The Crimean War: Then and Now is a truly unique visual record to accompany both a narrative of the event and a tour of locations. The author has shown amazing patience to obtain present day photographs to match exactly contemporary pictures and paintings. The aerial views of battlefields and other points of interest are also useful making events more graphic and an aid to interpretation of the actions that took place. The book will be of special interest to those for whom an accurate study of the ground will help in the interpretation of the strategy of the war and also for those who need an accurate battlefield guide. For those looking for a definitive history of the Crimean War this is probably not the obvious choice of reading, however it is exceptional in its’ articulation of what the battlefields were like then – and what they are like now. The author has completed a thorough historical investigation and the beautiful colour renditions of over three hundred and fifty images make this a book that would be as equally at home on a coffee table as it would be on the shelves of a serious student of the Crimean War. The book is a labor of love. Each chapter describes a battle of action, includes maps pointing out locations and then contrasts period illustrations with a view from the same angle today. It is fascinating how the terrain here has changed in a little over a hundred years. More trees and orchards change the look of many battlefields. The river Alma has also changed greatly as shown in the pictures today. The viewer also gets a better idea of the terrain. The hill that the Light Division rushed up to capture the great redoubt looks very gentle compared to some prints. The area the 93rd Highlanders held, and the area the Heavy Brigade charged have me better understanding of this actions. A mystery to me has been the photographs taken by Colonel Vladislav Klembovsky in 1900 of the battlefields. I finally know who this man was and his tragic story during the revolution. The book is not cheep,but is well worth it. Highly recommended! 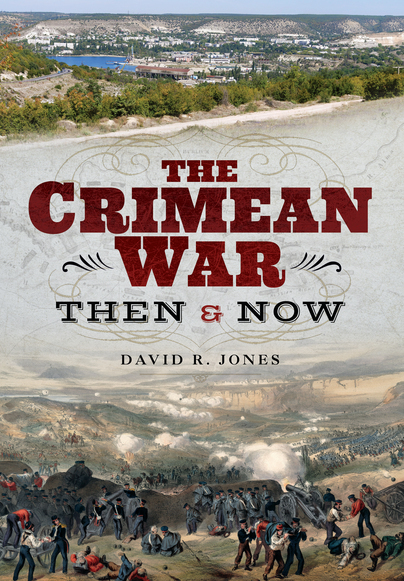 DAVID R JONES is an amateur historian with a keen interest in the Crimean War. This interest led to several visits to the Crimea to walk the battlefields and stand in the footsteps of those photographers and artists who recorded the scenes. Born in Birmingham in the UK, he was raised in nearby Dudley before attending the universities of Hull, Exeter and Keele to study botany and then plant diseases. His professional career has been as a plant pathologist specialising in the problems of banana. He has retired to Jervis Bay on the south coast of New South Wales, Australia.